The EMS 9000 Laboratory Microwave Oven represents a state-of-the-art solution for performing many of the steps in sample preparation prior to either light or electron microscopy. Procedures such as fixation, staining, dehydration, decalcification, impregnation, polymerization as well as immunohisto and cytochemistry can be done with ease in the EMS 9000. The EMS 9000 offers a significant reduction in processing times while obtaining improved results. The EMS 9000 features a touch pad keyboard that allows for all settings to be programmed quickly and easily. With a very well defined adjustable effect, accurate temperature control, well ventilated chamber, and three different timing modes, the EMS 9000 is the most advanced microwave processor available today. Our temperature control not only prevents the tissue in the chamber from becoming denatured (by high temperature) but it also assists in pulsing the microwave effect in small precise portions. The temperature control has a direct effect on the magnetron for it allows the unit to switch on and off in the most efficient way at the preset effect level. The temperature probe is mounted on a ball swivel that allows for easy placement of the probe within the microwave chamber. In addition, the probe is made from stainless steel and it is quite flexible so that it may be bent and formed as required to place it in various shaped containers. The temperature sensor is located at the tip of the probe. The set effect is adjustable at anytime either before or during a run. This aids in the balance of the microwave load and the content of the microwave absorber. It should be noted that the penetration rate and process times are influenced by the presence of microwave radiation in the chamber and for this reason it is imperative that the effect rate be adjustable. The unit allows for preset parameters, which are stored in the EMS 9000 memory and are called upon to perform particular processes automatically. Inside the chamber there is a manifold for up to 5 tubes that allows you to achieve bubble mixing in from one to five containers at the same time. There is a built in air pump that facilitates the mixing and avoids temperature gradients in the mixing process. These adjustable bubble mixers make the EMS 9000 ideal for decalcification. Our unit is so versatile that you have the option to run it in three different modes depending on your application. a. Time at temperature – The timer starts after the selectable threshold temperature is reached. The timer measures the time of the process at the set point temperature. b. Total time – The timer starts upon entry into "run" state and measures the total time of the process including the ramp-up time. Count up and Count down Timing. 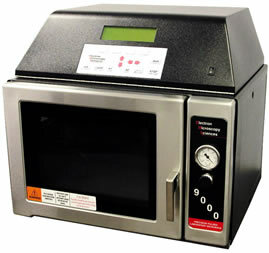 The EMS 9000 processor has two microwave power control modes. Temperature – Under the temperature control the power is adjusted in a closed loop fashion to obtain a particular temperature profile. Power –Under power control the power is adjusted in a fashion that ignores the process temperature as a control factor. In both of the control methods power output is pulsed with a one second cycle time. However because the EMS 9000 can supply power pulses as short as 10 milliseconds, the power output can be finely tuned to provide excellent control in both modes. The system has many unique safety features that make the EMS 9000 the safest unit on the market. The on-board screen will caution and shut down the system if there is high probe temperature, system over temperature; keyboard error; inoperative vent or low probe temperature. The oven chamber is made entirely of stainless steel and is very easy to clean. It is extremely resistant to all staining solutions and solvents. The floor of the unit is ceramic which serves as a thermal insulator and will not absorb microwaves and it is completely chemical resistant. The EMS 9000 is designed for easy operation and maintenance. All of the controls can be set with one hand and are easily accessible allowing for changes at anytime. The unit has a built-in reflector inside the chamber that evenly distributes the microwaves and prevents "hot spots" from forming even for very small volumes. Fluid Ports: 2 ports supplied as a standard – accepts up to 3/16" hose. Continuous Run: Timer override works as a count up timer for an indefinite period of time. 100, 120, 230 volt models FCC approved, CSA NRTL approved. Sturdy, heat & chemical resistant guide allows exact placement of processing chamber every time. Lynx I specimen vial are locked in and tip-proof during processing. That's the specimen basket holder assembly in the rear vial. User may mix and match the basket configuration to match the workload. Microwave processing tissues for electron microscopy can yield inconsistent results caused by different microwave distribution patterns within the microwaves chamber. Exact, consistent placement of samples within the chamber is key to achieving uniform results. After two years of development and testing at a leading University Hospital, Electron Microscopy Sciences is proud to introduce the MPC 9000. The MPC 9000 developed only for our use in our top-of-the-line EMS 9000 laboratory microwave processor, hits the target that every laboratory needs: consistent processing, vacuum infiltration, and quick specimen turnaround. Sturdy heat and chemical resistant guide frame. Uses standard EMS Lynx I & II specimen handling technology. 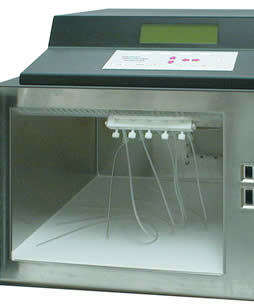 Two tip-proof processing stations for disposable processing vials. A wide range of processing baskets configurations available. Feed-through for process temperature probe placement while under vacuum. Low maintenance chamber disassembles for easy cleaning. Made from Pyrex® glass which offers better temperature conductivity and stability than any other material and is chemically resistant and microwave transparent. he EMS 9002, when used in conjunction with our EMS 9000 processor, improves ultra-structural preservation during microwave assisted chemical fixation and reduces infiltration times dramatically. Dimensions Tray: 12" x 10" x 5"
Used in conjunction with Vacuum Processor Bowl and Vacuum Processor Cover. For processing of tissue samples in the Microwave Processor. For cassette storage during tissue processing. Used to transfer processor bowls in and out of microwave processors. Made of durable microwave transparent polypropylene plastic. 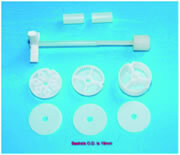 Used in conjunction with Vacuum Processor Cover and Vacuum Processor Tubing Kit. Silicone has a high resistance to extreme heat. The silicone holds each bulb snugly and prevents bulb spillage during handling. Each bulb in the mat is 2.5cm apart. The mat is divided into quadrants. A mark on the back left corner of the array lid is used to key the back left corner of the oven. There are letters and numbers along each edge for easy placement on the Alpha-numeric tray. The mat size is 8" x 8".